Things are picking up each day. As always there are some good moments and not so good moments. Each Monday begins a new routine, yet what is hilarious is that we are all planning for the next big trip. Whenever I try to use a computer in the computer lab at IES, there are usually some students logged onto RyanAir or discussing which hostel to spend their trip in. It’s an element of living in another country that makes it that much more exciting. My day on the other hand was not very exciting so here is a quick synopsis. Like most of the other kids in the program, I have started to get a cold and have been upping my doses of Emergen-C and washing my hands as much as possible. I was quite disappointed by lunch selection, although I did try to experiment with various shops. Last week I had walked past a wonderful looking bakery that was called “The Organic Bakery of Barcelona,” how original. If I were in the very organic, fresh, expensive mindset and willing to drop at least 15 euros on lunch daily, then yes, this would have been an excellent choice. There was a fresh bread section, organic meats and cheeses, a wide array of pastas and sauces, as well as sushi, pizza, wok, and salad menu. After browsing a bit, I went for a pre-made salad. It was good, a little overpriced, and not too filling. Oh well, I can write it off as an experience. One girl at lunch was funny because she commented how my fork (or rather one of those good-‘ol sporks from elementary school) was basically a piece of wood and hopefully I wouldn’t get any splinters. Sure enough you could see the shavings of wood hanging delicately off to the sides. On the way home I decided to stop into this kid’s store called the Imaginarium, where I had seen a frozen yogurt shop. It turned out to be a stand inside a children’s clothing store and sponsored by Dannone. 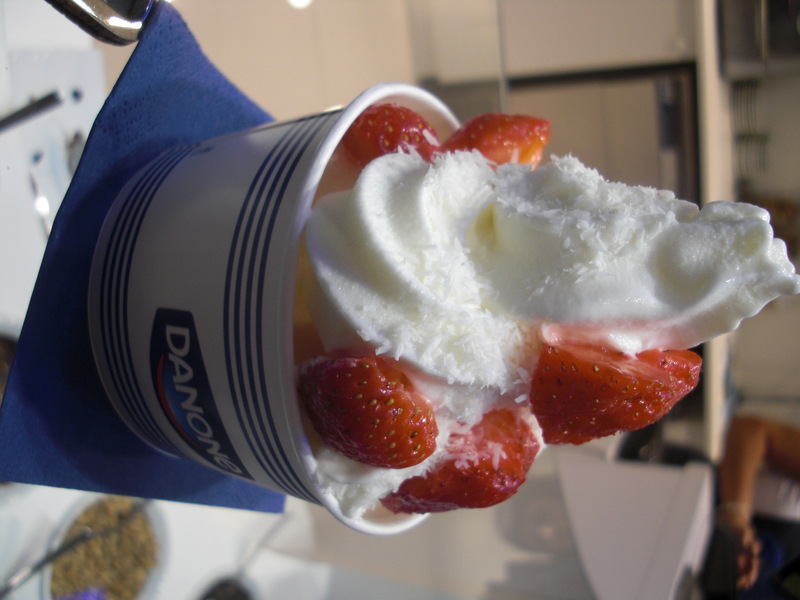 The yogurt was good, very much like Pinkberry, but the strawberries nor the coconut were near as fresh. Again, another experience. So even the little things add up to something learned. 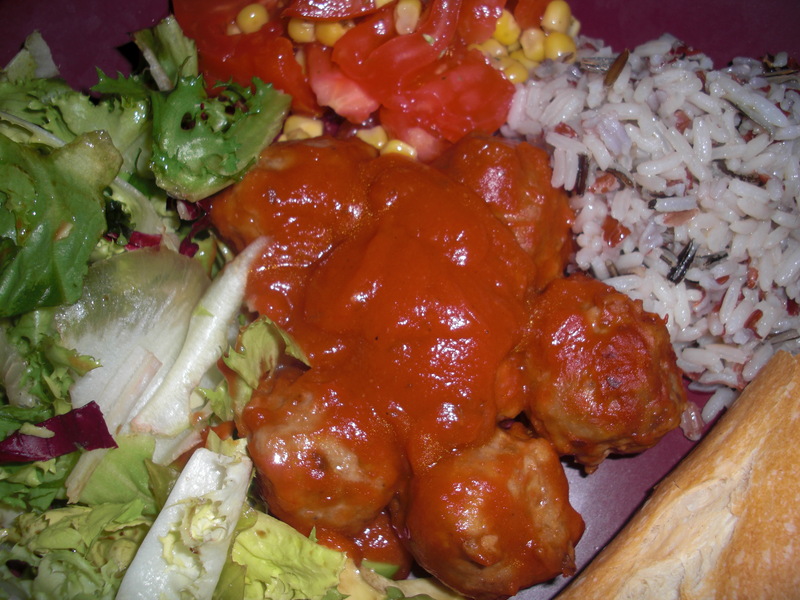 Dinner tonight was rice, salad with avocado, meatballs, tomatoes/corn, and baguette. Conchita laughed at me because I had to rearrange the plate so it was “pretty” in order to take a picture. Off to bed to hopefully get some more sleep, although may not be likely with the lovely dog barking outside.